Beautifully crafted Monopoly from artist Romero Britto! 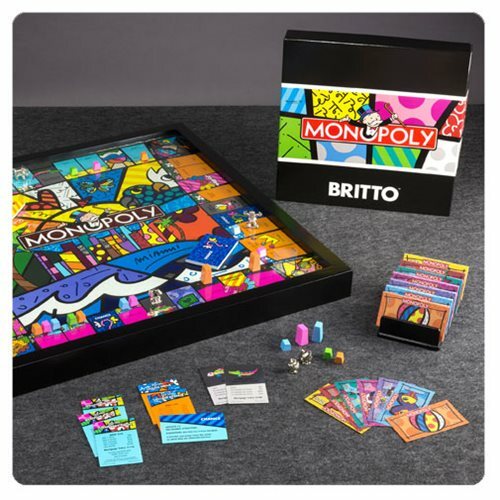 Includes Britto designed Monopoly tokens, cards, and money! Features custom Miami themed artwork! Pop artist Romero Britto has fused his wonderfully optimistic philosophy and art style with the world's most iconic game to create the truly remarkable Monopoly Miami Edition by Romero Britto! This creation features artwork and game components that showcase his adopted home of Miami. In addition to its vibrancy, the artwork is adorned with beautiful foils and glitter to create a truly stunning piece of art. The Monopoly Miami Edition by Romero Britto features premium Monopoly money, Chance, Community Chest and Title Deed cards, and die cast tokens designed by Britto that will allow you to enjoy this creation with every roll of the dice. Featuring a beautiful wood frame and glass top this masterpiece would look great hanging on the wall! Measures about 23 1/2-inches wide x 23 1/2-inches tall x 2-inches deep. Ages 8 and up.